I’ll be talk­ing about some of the fab­ulous things you can do to replen­ish your adren­al gland stores to restore energy and vital­ity. Those of you who are feel­ing tired and wired at the same time should be pay­ing atten­tion closely — you know who you are! Your life is a roller coast­er of highs and lows. 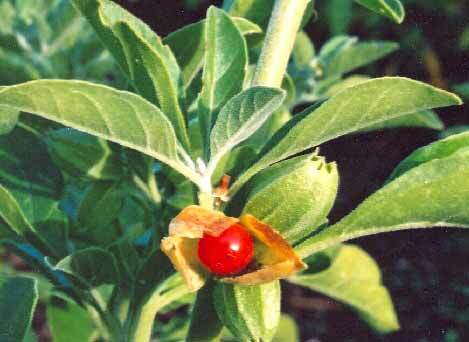 One of the answers for you is ash­waganda, also known as Indian gin­seng (lat­in name Withania som­ni­fera). Origins of this herb are from Ayurvedic medi­cine, designed to pre­vent dis­ease through the res­tor­a­tion of bal­ance. Ashwaganda is fant­ast­ic in its abil­ity to not only sup­port and restore energy while calm­ing and sup­port­ing irrit­ab­il­ity, anxi­ety, and insom­nia. Its true strength is the rebal­an­cing of the nervous sys­tem from an over­stim­u­lated, sym­path­et­ic state to a para­sym­path­et­ic state. There are count­less stud­ies where the use of ash­waganda demon­strates anti-inflam­mat­ory, anti-oxid­ant, anxiolyt­ic (anti-anxi­ety), anti-can­cer, stress-bust­ing, and sed­at­ing effects. However, because of its sed­at­ing effects it can add to the effects of ben­zo­diazepines or phar­ma­ceut­ic­al sleep aids. The bene­fit of this is that it could be used in place of phar­ma­ceut­ic­als to assist with sleep. Typically ash­waganda is found in adren­al ton­ic for­mu­las to sup­port the sys­tem, and can be taken in liquid (tinc­ture) or herb­al form (in a com­pressed pill or cap­sule). Now doesn’t that sound bet­ter than B12? Romm, Aviva (2010) Botanical Medicine for Women’s Health. Churchill Livingstone, New York. © Copyright 1995 – 2011 Therapeutic Research Faculty, pub­lish­ers of Natural Medicines Comprehensive Database.